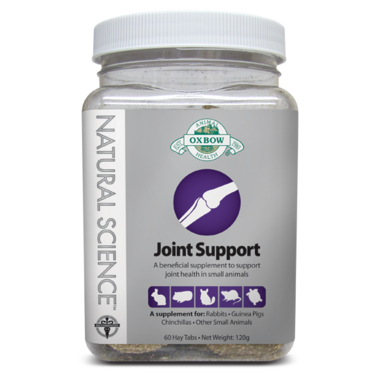 Oxbow Natural Science Joint Support is a high-fiber supplement containing various beneficial ingredients to support the overall joint health of your pet. Glucosamine aids in the prevention of cartilage degeneration, and turmeric and yucca exhibit anti-inflammatory properties. This product is really fantastic and work very well and very fast to help old rabbit to feel better! I feed her Spring water from a syringe, while she enjoys her tablet and special time with me. I also use a little laser on her sore joints. She is happy and runs, although getting older. I noticed my rabbit was having some trouble jumping up. Tried this product because it was recommended by my vet. It seems to have made a huge difference. She's jumping up like she did years ago and she loves the treat. She rips it out of my hand and runs off to eat it.